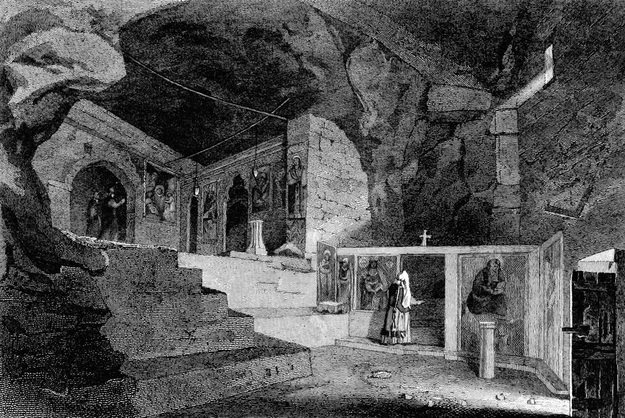 The cave sanctuary of Apollo and Pan under the North Slope of the Acropolis, turned into a Christian church of Panaghia Spilliotissa (the one of the Cave). A Classical and Topographical Tour Through Greece, During the Years 1801, 1805, and 1806, Vol 01 - Edward Dodwell FSA. This type of "popular" religion is attested vividly on the North Slope of the Acropolis, where many shrines were nestled among the steep cliffs, caves, and pathways. For example, at the northwest corner Apollo, Pan, and (probably) the Nymphs were worshiped in shallow caves. Also on the NW side there is a cut in the rock and stairs leading to several natural caves and to the Klepsydra Spring. Farther to the east, Eros and Aphrodite had an open-air sanctuary. Evidence for other shrines is provided by numerous rock-cut niches for the dedication and display of offerings to gods whose names we do not know. The sacred spots on the slopes of the citadel were connected by an ancient path, called the Peripatos, that circled the Acropolis and intersected the Panathenaic Way at the western approach. It is also likely that most (if not all) of the North Slope was within the sacred area at the foot of the Acropolis known as the Pelargikón. Rooftop view of the Acropolis rock from Ava Hotel and Suites. In this area we recommend Ava Hotel and Suites, on Lysicratous Street. Featuring neoclassical décor with carefully chosen wallpaper and furnishings, all rooms are spacious, air-conditioned and soundproofed and all rooms have a private balcony or terrace.